A friend of mine just finished a very powerful documentary about one Ecuadorean village’s resistance to a huge mining operation. I am helping him with the online marketing of this film, and getting to put into practice some of my ideas about building an audience for issues-based documentary films. This is going to be fun. 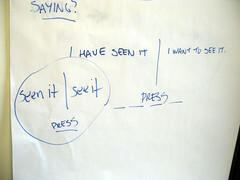 Three buttons on the front page: see the film | seen the film | press (because it seems most press people can’t find anything not on the front page, in large type) . Decided against that approach, but it would be fun.